1 – write it down. everywhere. Well, not everywhere, because that would be overkill, but all important dates, times and general things I write down on my yearly calendar, the calendar in my phone (synced to google calendars), and now in my filofax. While this forever renders the ‘I forgot’ excuse redundant, it does keep me aware of essay deadlines and other important (or just exciting) events. I used to be a massive advocate of the floordrobe, the haphazard desk, and ‘I’ll put it away later’. This, for me, was probably the hardest habit to break – but giving everything a place when I moved into the uni flat last year has helped me keep everything neat and tidy – within reason. If you’re struggling to stay organised, I’d definitely suggest doing a desk/room/workspace refresh – take it all out, move it round and put it back in set places. When everything has a ‘home’, if it’s not there it bugs me until it is. I have 3 essays due in April/May, and the deadlines are at weekly intervals, so it seems silly to emphasise, but the one that is to be handed in first, gets finished first. For the non academic side of my life, if it’s not a pressing issue, or if there is no deadline, then the thing in question is placed lower down than something that is. I guess this only applies to those of us who enjoy making lists, or at least find them useful. I’ve found that writing a to-do list at the end of each day for things that absolutely, positively, 600% have to be done the next day helps. I haven’t invested in a ‘list book’ (yet) but post-it’s are your best friend. I think one of the reasons I was so unorganised before was because I thought that if I was, my day to day activities would be put in little boxes and I’d be running on a monitored schedule. It scared me, thinking that making myself more organised would mean having to section my time up or something. And then I realised that being organised isn’t (necessarily) planning out every aspect of your day. Funny that. It just means that I know what’s happening and when, rather than scrabbling for dates when someone asks me when I’m free. Or actually knowing where that notebook with all my blog post and youtube ideas actually is. Or being able to throw a party – handy for some things on the horizon. Since actually taking these steps to flip myself into something of a more put together person, I’ve managed to be a ‘super keener/overachiever’ and get essays handed in way before final deadlines, and I found that even my approach to revising for exams had improved. 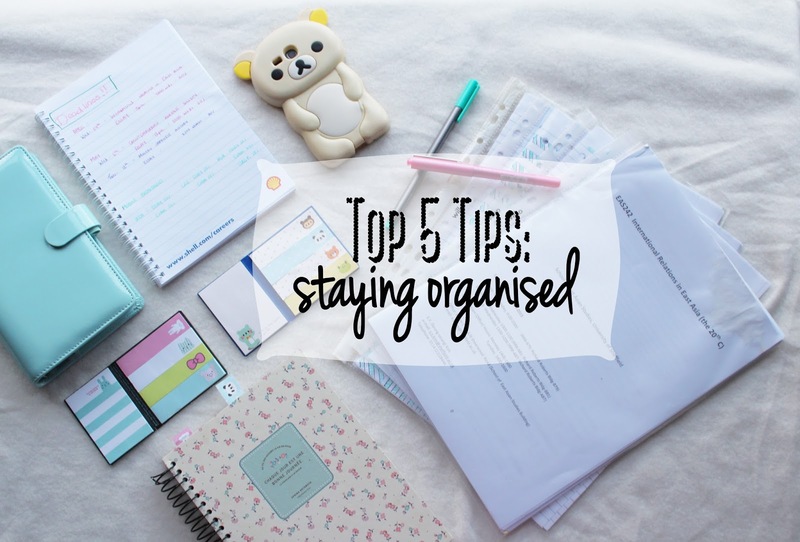 Do you have any tips for staying organised? Anything you do or have that is a must for keeping on top of things? I invested in a filofax, and it is actually changing my life! "What I’d Wear: Missguided New In"
"Get to Fashion Week* | ad"
great post! i literally live my life via lists hahafrom helen at thelovecatsinc.comps. win the rose gold GHD styler and hairdryer on my blog here!